I never get tired of the view from my stone-walled terrace in Basilicata, Italy. My little 300-year-old casa is built on the edge of town and overlooks fields of grain and grazing sheep—their bells tinkling as they meander the hillside across from us. Beyond, the Dolomiti Lucane mountains, with their distinctive spire-like peaks, turn from grey to cream to pink, depending on the play of light and clouds. They get moody when it storms and gleam vibrantly in the sun. I look out at them often throughout the day, my mind calming at the mere sight. We dine on the terrace from spring through fall, enjoying our private flagstone space. After two decades of looking at the Sandia Mountains in Albuquerque, this view makes us feels at home. We love the landscapes here and we love village life. While the location at the edge of town makes us feel like we’re in the country, it is just a few minutes’ walk along the cobblestone lanes to get to the piazza and our local coffee bar. Despite its small size, the village has everything we need. There is a bakery that makes amazing, tasty and crusty bread; two bars where you can get a coffee in the morning and a prosecco in the evening; a fruit and vegetable shop with fresh produce; a butcher that carries locally-raised meat; and two grocery shops that carry all the staples. It’s a habit to go pick up what we need for lunch, enjoy a bit of chit-chat, and catch up on the news around town. Life on a human scale. We initially came here to find my roots. My grandmother’s family came from this place, and we came to see her hometown. We discovered not just the town, but family ties that drew us back. In the end, our hearts decided this felt like home. 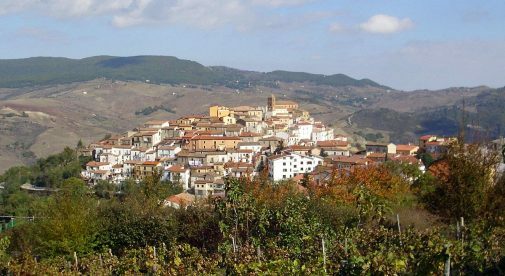 Basilicata is a hidden gem, a place of thick forests, verdant valleys, rolling hills, and high mountains. It is filled with beautiful landscapes everywhere we look. My love of history is satisfied with ancient sites, while Bryan’s enthusiasm for the outdoors is fulfilled with the national forests and riverside trails. Basilicata isn’t the fashionable Italy of Renaissance splendor. It is laidback. It is a rural land—there are no shiny Ferraris, and the only Lamborghinis we’ve seen are tractors, not sports cars. It is the relaxed lifestyle we were looking for, where people know our names and where Old World traditions are still lived out in daily life. It’s the kind of place where people leave their keys dangling from their doors, and where friends and neighbors share the bounty from their gardens and their wine cellars. In exchange, we help with English translations and lessons, host American dinners for our friends, and participate in the town’s festivals. We love taking walks in the mountains or along the country lanes outside the village, and we get out and explore the diverse landscapes and historical sights of the region. Some days we decide we want a dose of sea air and drive an hour to Salerno for a walk along the waterfront and a seafood lunch. We investigate the backroads and country restaurants, and hunt out the local food festivals. But mostly we live out our daily relaxed rhythm here at home, balancing writing, translating, and travel planning with walks, time with friends, visits with my cousins, and at the end of the day, a glass of wine on the terrace to watch those mountains tinge in the fading light.